Happy FALLLLLLL! It is the most glorious time of year and one of the best times to entertain and invite family and friends over to eat all of the fall foods you love. I have said it before, but I love putting a tablescape together. I don’t know what it is, but getting to decorate a small area like a table is fun for me. Not only do I have fun with it, but I want to shout it from the mountaintops that it doesn’t have to be hard. 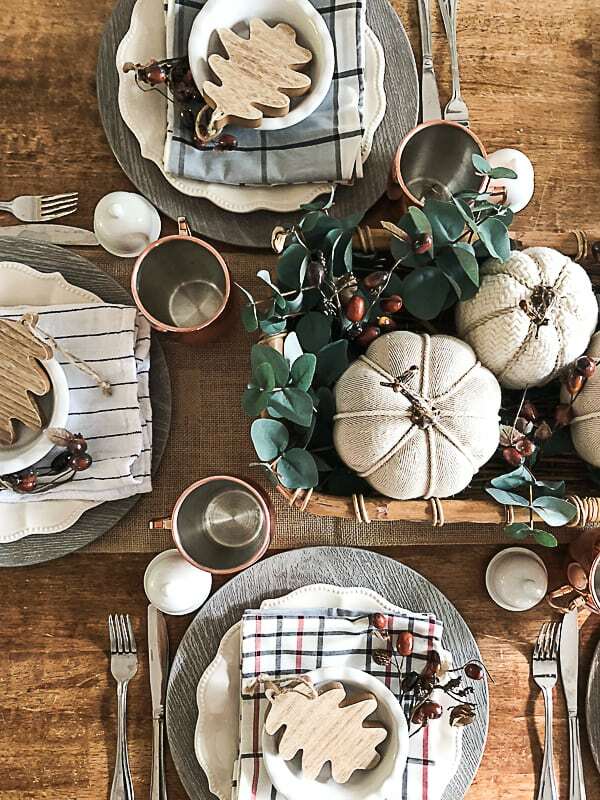 A simple, fall table is always the best table because the goal is to encourage conversation with the people around the table. Once you add to much stuff, the focus is not about the people and the flow isn’t as comfortable. 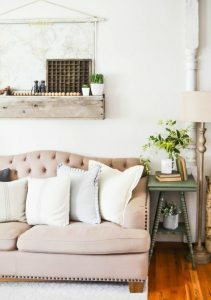 Make is easy, comfortable and cozy and the entire time together with your guests will follow suit. 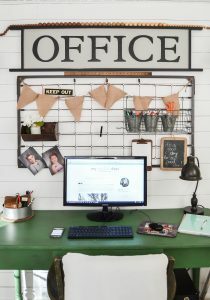 I am joining my friends to share all kinds of fall ideas with you. If you are coming over from The Latina Next Door, WELCOME! 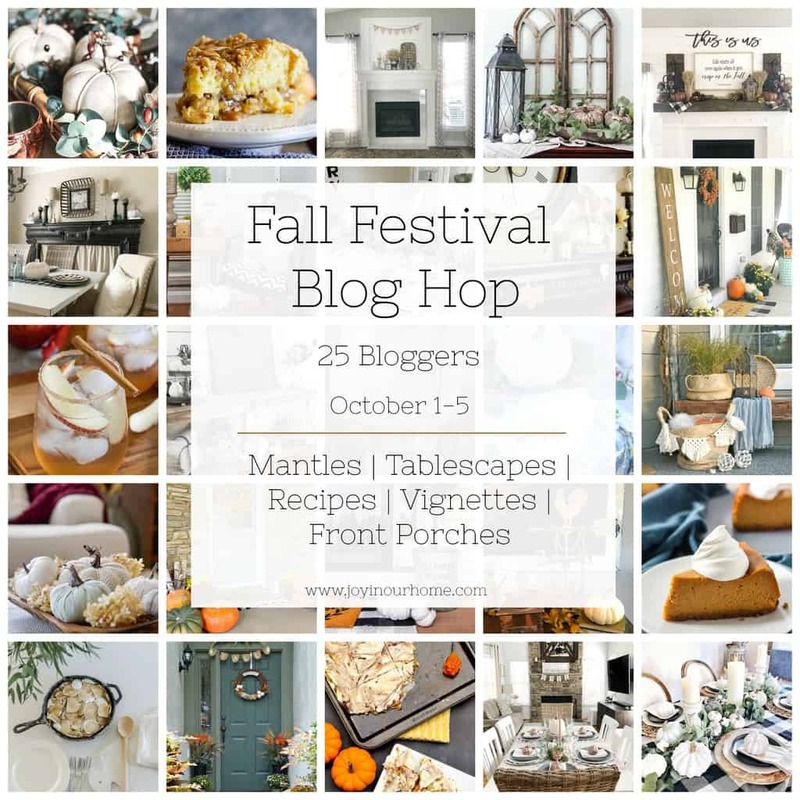 You will find all of the other fall posts on this blog hop at the end of this one, so stick around! You won’t want to miss any of them! This fall table has a lot of items that cost $1 or less! 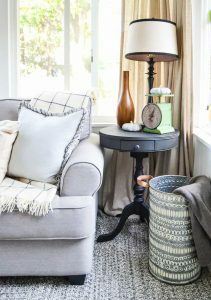 I am always searching for ways to get the look I want for a lot less and I did it with this fall table. A lot of people get overwhelmed with the thought of setting a tablescape because they think it has to look a certain way or cost a lot of money. That is not the case at all. It is easy and inexpensive to have family and friends over. Trust me. If it wasn’t, we wouldn’t do it. I created a list at the end of this post with items I used or similar items so you can easily find them. I started this fall table with a burlap runner I already had down the center. Then, I set a basket I found at my local thrift store in the center of the table. I filled the basket with eucalyptus stems and $3 Target pumpkins. After that, I started setting the table. I found wood-looking chargers at the Dollar Tree that I set down first. Then, I put a white plate on top of that (I found the white dish set at a thrift store last year). After that, I put a plaid towel on the plate (to use as napkins) and a mini pie plate on top of that. I added a wood leaf I found in Bullseye’s Playground (formally known as The Dollar Spot) at Target inside the pie plate. (I made pumpkin pie in the mini pie plates later on and will share that recipe soon). I was at a thrift store when I found the mini pie plates and the individual butter domes brand new in the boxes! I couldn’t pass them up. They were too cute and I knew they would make a fun statement on my fall table. There is nothing better than warm pumpkin bread in the fall so the little butter dishes are perfect for fall goodies like that. The acorn stems were another thrift store find. They were brand new on a wreath form so I couldn’t pass them up. I love the color they add to the table. Copper mugs are a staple for us in the fall. When you add them to a fall table, they really stand out and make a sparkly statement on the table. That pretty much sums up what I did to set this table. See! Nothing hard or expensive about it at all. 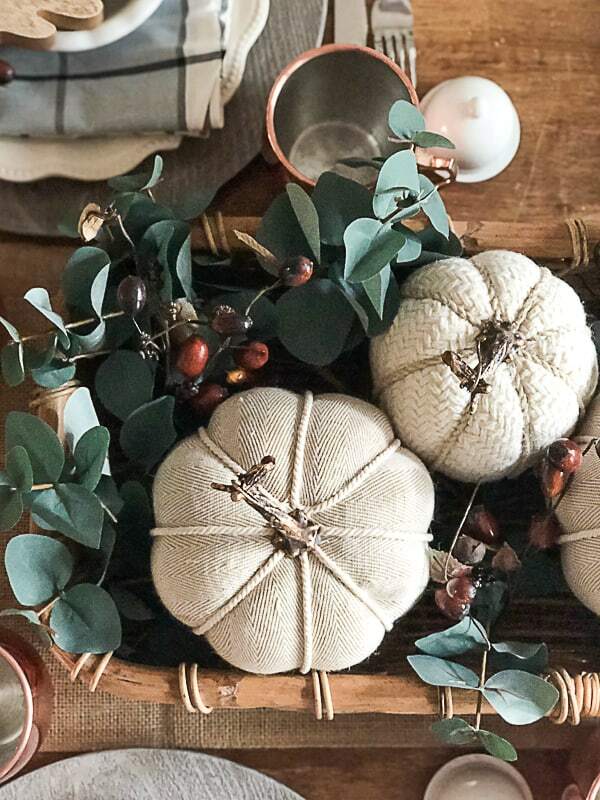 If you are setting a fall table this season, I have a few tips to save you a ton of money: First, head to your local thrift store to see what you can find. You would be amazed what they are setting out in the store this time of year. 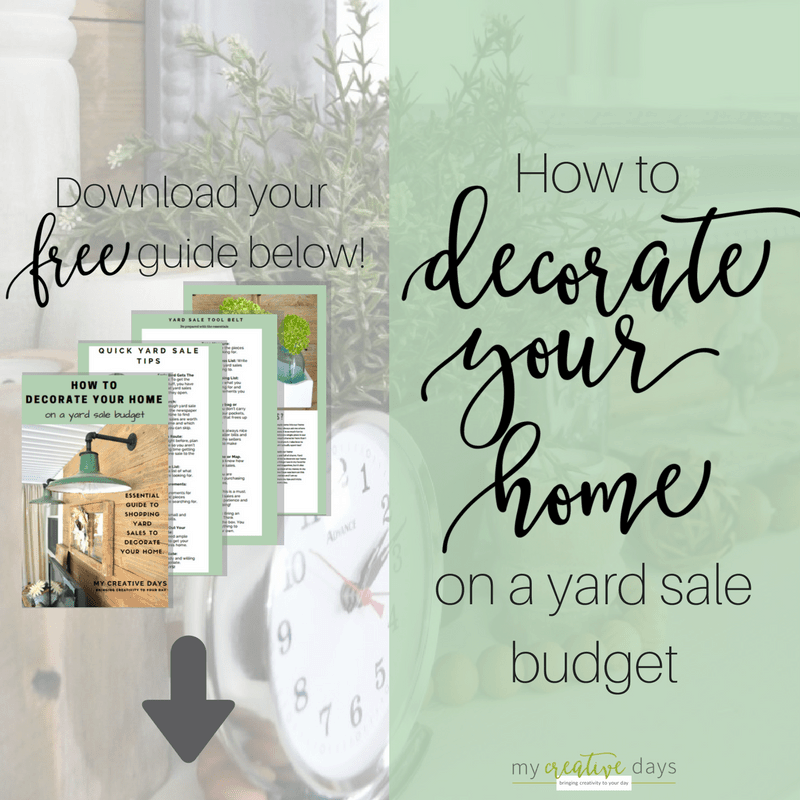 Next, shop your home. Use things you already have in a new way on your table. Last, if you think you need something else, Bullseye’s Playground at Target always has inexpensive, seasonal decor. 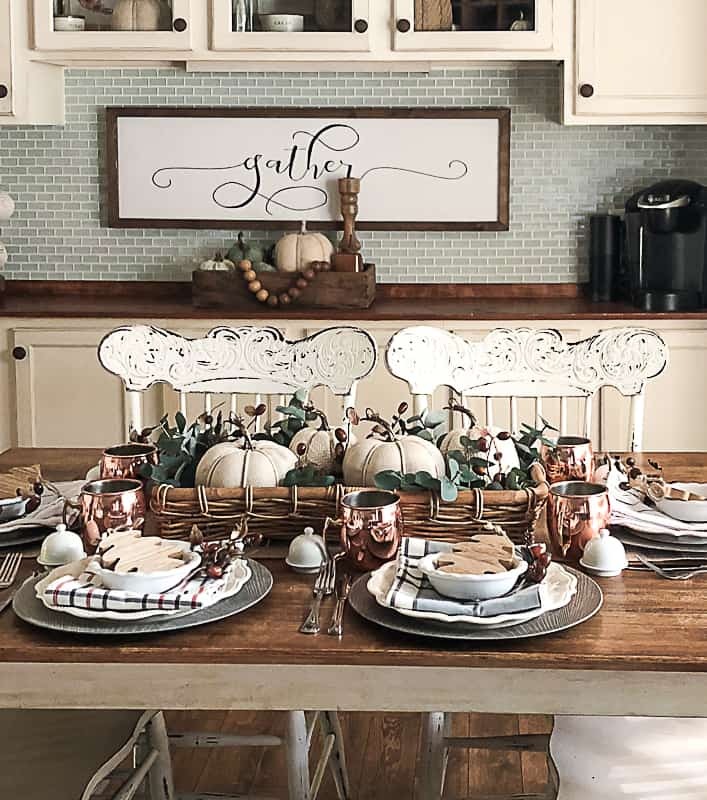 I hope this post inspires you to set a beautiful fall table this season and invite people over. Entertaining doesn’t have to be hard or cost a lot of money. Don’t let that stop you from doing it more often. 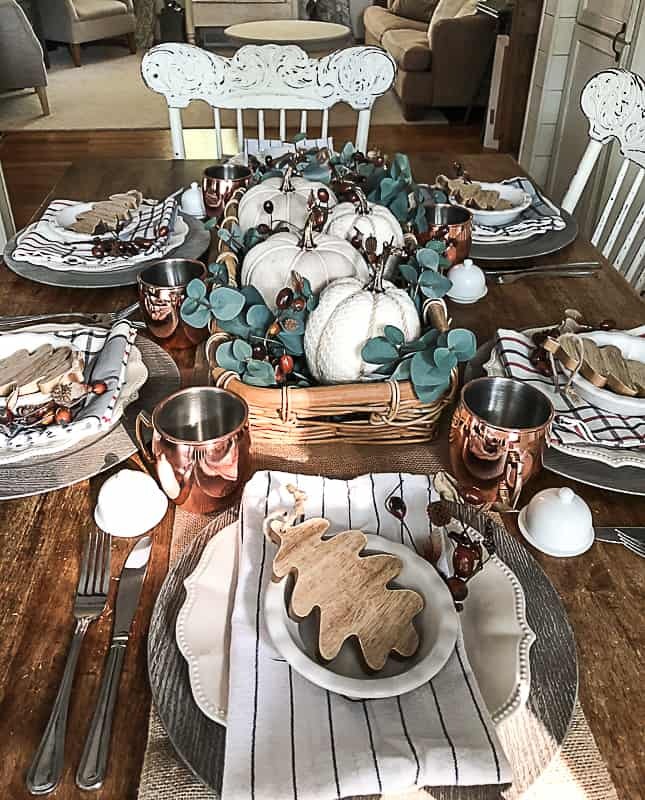 Celebrate the season with the ones you love and enjoy the memories and conversations that will happen around your fall table because ………………… that is really what it is all about. Change your mindset, use some of my tips and share your fall tables with me! I would love to see them. Thank you so much CoCo! I would love to thrift together! We would have so much fun! 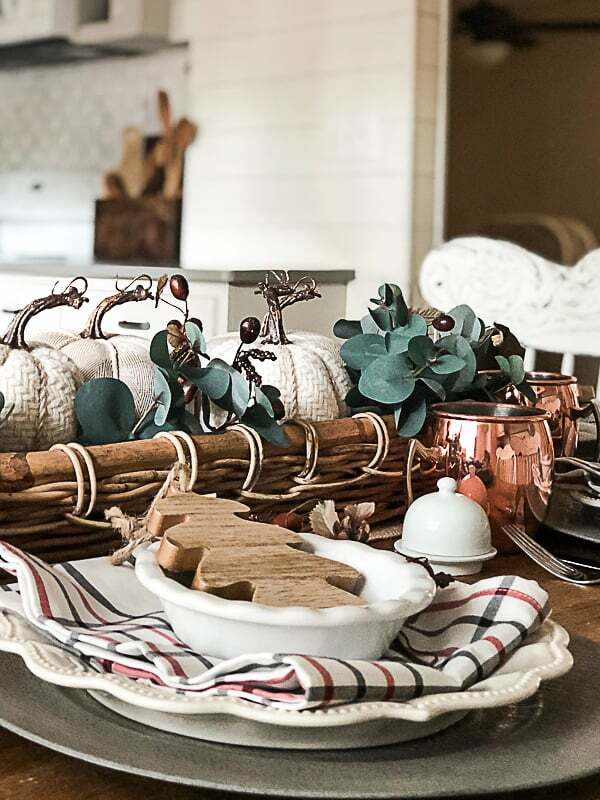 Lindsay, you’ve created layers upon layers of fall goodness on this table! 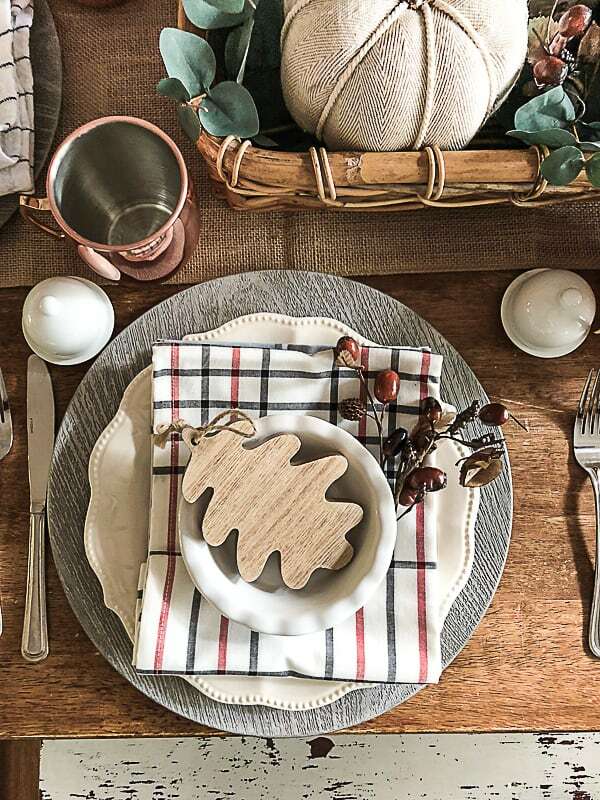 I love it all from the old painted chairs to the leaves at each place setting. Beautiful! Thank you Stacey! This tour has been so much fun! 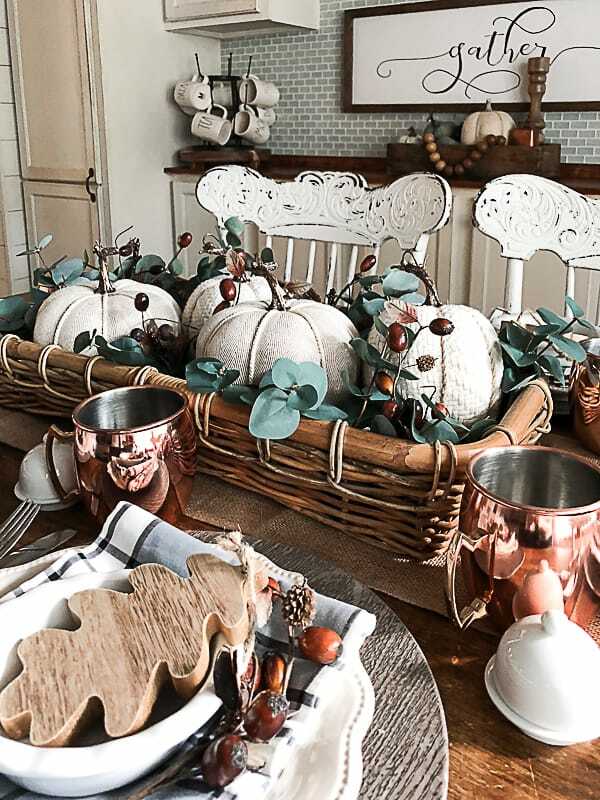 Those copper mugs and fabric pumpkins are my fave for sure! Love how you styled your table and kept it budget friendly! Thanks for sharing…. Oh my goodness, I just LOVE how cozy this all feels Lindsay! So many adorable little details and that centerpiece is so pretty! Thank you Kristi! Love touring with you! 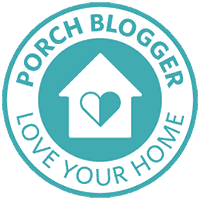 Hi sweet Lindsay, it’s been a while, I just haven’t been blogging much and keeping up with all my blogging peeps! Your table looks gorgeous and I love the wooden leaves. Happy Fall to you and make sure to save me a seat? I want to sit on the old painted chair ok? Your seat is saved! So good to hear from you! Happy fall to you! Thank you Cindy! They were a great find! 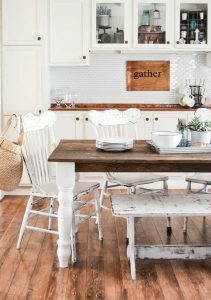 Wonderful table..love the individual butter dishes …have never seen those before and would like to find me some! They are so fun!!! I linked them in my post! 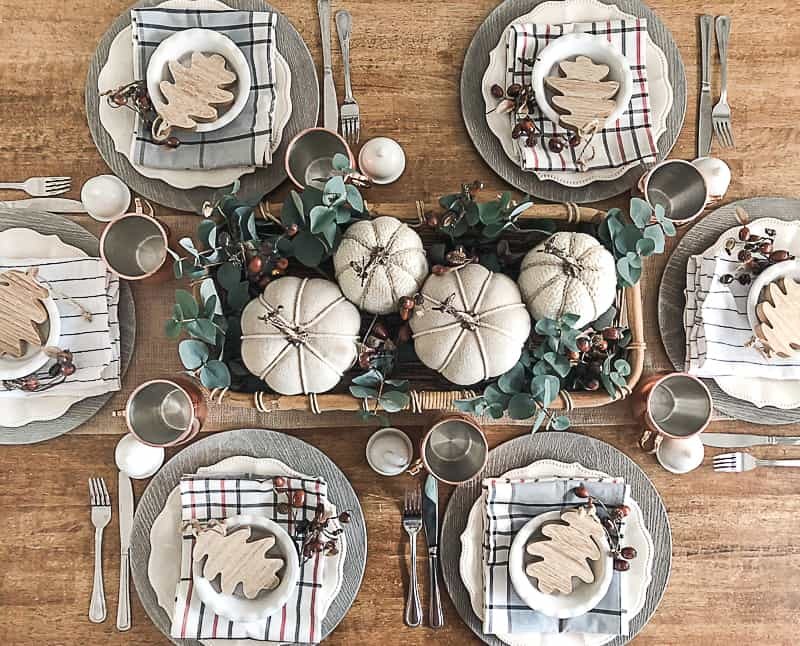 Lindsey, your fall tablescape is simply gorgeous! 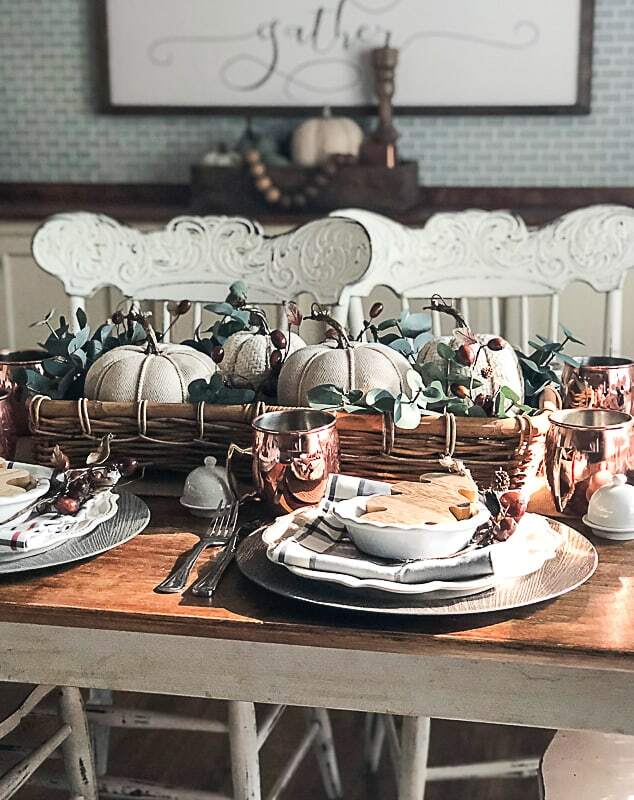 I love how you incorporated the copper mugs, and the wooden oak leaves are gorgeous and the perfect finishing touch to your tablescape. So happy to be on this hop with you! Thank you Michelle! I am loving all the ideas on this tour! I have those same kitchen towels!! And I love the idea of using them as napkins!! Beautiful tablescape and thank you for the lovely ideas!! I’d love to be invited somewhere for dinner where the table looks so pretty! And to know that you did it on a budget makes it even better. We all need to be reminded that we don’t have to spend a lot to create something that looks nice. So pretty Lindsay! 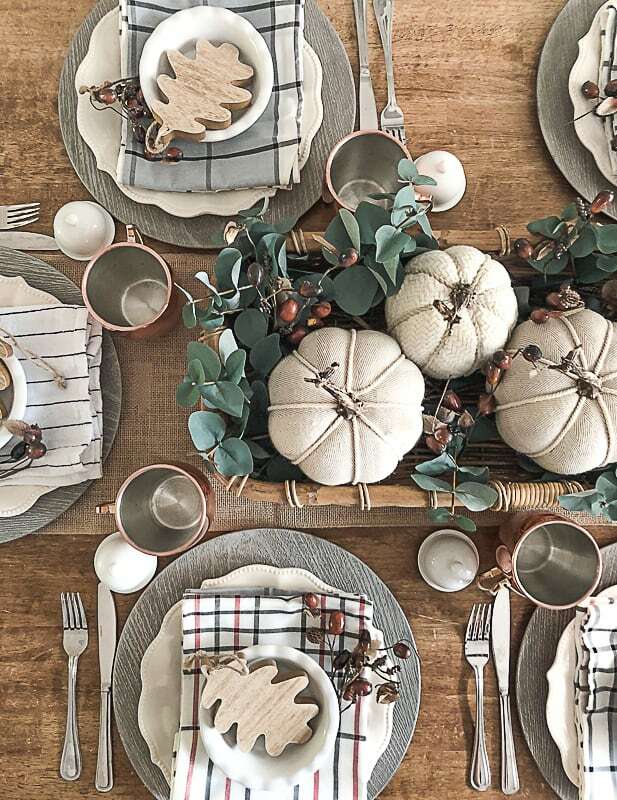 Love all of the different textures you used to create your pretty fall table.